Basting spoons are not just for basting. An incredibly versatile tool good for anything from skimming fat to scooping up pan sauce, the 21" basting spoon is perfect for all of your kitchen needs. This spoon's shallow bowl is extremely efficient for collecting the last delicious meat drippings, and its 18/8 stainless steel construction and long, 17" handle are great for reaching the bottom of the pan while keeping your hands out of the heat. This lightweight steel is engineered to be more graspable than ordinary bases and the convenient, built-in notch will keep the spoon close at hand, preventing it from sliding into the pan. This is the percfect spookn for those extra large or extra deep pots. Very well constructed to match its very elegant exterior, this is a great product!!! This is a great basting spoon. So much nicer than the medium weight spoons. This price is great for a heavy duty spoon. I just wish other lengths were available through webstaurant. We actually bought these to reach the bottom of our three gallon tea urns to stir the sweet tea and they look and work great. Getting a longer spoon really made a difference around here. Why didn't I think of it before? No more hot spoon handles! Would buy again. I have been searching for this product a long time.I bought from other places but they wer,nt sturdy like this spoon.I will let others know about this site my fellow caters.when I am cooking perlous my spoon want buckle in the middle,or when I fixing soups for the soup ministry.I really stumbled on to your web page.Thanks so much Dee. I use the twenty-one inch Heavy Duty Solid Stainless Steel Basting Spoon on a regular basis. I have not noticed any sign of wear at the neck, even after multiple uses with heavier items. Works well, great solid construction, not too heavy and easy to order. I have been very impressed with all of the kitchen utensils I have ordered fro Webstaurant and will continue to order. A solid spoon that is a perfect size for a 40 qt stock pot. You will need to use some Goo Off to remove the tags, but that's a one time, easily remedied problem. Stirs the thickest of fruit jams and pie fillings in my 36 qt stock pot. A must-have at canning time. I thought I needed a two-handed paddle but this spoon is sturdy and lets you get all the way to the bottom without flexing nor bending. The 21" heavy duty solid stainless steel basting spoon is perfect for commercial kitchens. With it's extra long handle, you can easily stir soups or sauces in an extra large stock pot. 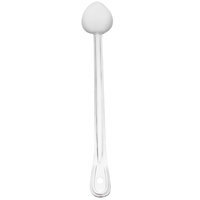 Wow this 21" heavy duty solid stainless steel basting spoon is a dream for large stock pots. The extended handle length makes stirring our stews/soups an easy job now. The value is great too!! This spoon is the perfect link We like two Nixon are sugar with the tea as it is brewing. This tea is the perfect length for those big industrial size tea urns. 21" heavy duty solid stainless steel basting spoon works great. I have no complaints and i'm sure it will last a long time. Great product and worth the money. Thank You! Bought it from webstaurant store. Works real well. Does the job. Strong and sturdy and handles nicely. Would buy again. Price is right, too! 4 stars! I love the length of this spoon. It has kept me from safe from many burns! It is not the heaviest spoon in my kitchen, but you can't beat the price. This stainless steel basting spoon is amazing! The solid stainless is really sturdy and has held up well in our busy bakery and cafe. Highly recommended! Very happy with the 21" Stainless Steel Basting Spoon. It's long enough for stirring our homemade soups and sauces to keep them from burning on the bottom. This is a great long spoon for stirring soups and sauces in large pots. This can be washed in the dishwasher. It has lasted us a long time. We have purchased a few. There is no better spoon than this 21" basting spoon. The bigger the pots got the more I was able to handle myself in the kitchen. These spoons can withstand any amount of work and are very durable. The 21" Solid Stainless Steel Basting Spoon is STURDY!! We love using it with our large stock pots. This spoon is great for mixing that meat with the Greens... Every Southern Cook need this Spoon! I bought a huge 8 gallon pot to make stocks in but didn't think about what I'd stir it with. Then while ordering a few other things I noticed this on here and bought one. I love it. It has a nice handle and its very sturdy, easy to stir our chicken stock with whole chickens, whole carrots, celery stalks and onions. I get veryexcited when I get new kitchen tools. bought this for my soap making, very long and sturdy, just what I needed.. Love it! This well-made spoon is perfect for use in a large stock pot. We use it in a 10 gallon pot, and because of the length we do not need to worry about burnt hands. I use long handled basting spoons to stir soups, stews, and other things in stock pots. The long handle on this spoon allows me to get to the bottom of 5 and 6 gallon stock pots without getting near the surface of the liquid. Good product, well built, will buy again. great sturdy basting spoon !! I use this for stock pot stirring. works perfectly !! anything that I make in the stock pot gets stirred with this well made spoon. it is strong enough and doesn't have that "will this bend" feel to it. very pleased. I needed a long stainless steel mixing spoon for home brewing and this fit the bill perfectly. Very reasonably priced which makes it an excellent value! Would buy again! Highly recommended! Five stars! Ah... the Chili Spoon ! That is what we call this long spoon. The ladies in our family make huge pots of chili for fall gatherings, and they always complained about the size of the spoons available for the job. Not anymore. I love this spoon no more burns from reaching into my biggest pot. The quality can't be beat for the price and it seems to be as solid as a rock. Do you need a ridiculously long spoon that holds up to abuse and doesn't immediately bend like a limp noodle? This is the spoon for you. It is great for getting to the bottom of huge stock pots, and the hole in the handle makes it easy to hang on the wall when not in use. I have no complaints with this monster of a spoon, it does its job well. Had a customer that was stirring liquid in a deep cooler and found this 21" long basting spoon. A very inexpensive solution to fix this problem. I was elated to find a 21" basting spoon to use with my deep pot. Now i can cook in it without the fear of burning myself when having to stir even the bottom of the pot. Super long and heavy made. Reaches into the deepest of pans, and is amazing for basting without buring yourself in the oven. Very good price. This 21" spoon is long enough for your biggest pot. It is a must have for a 40 quart or higher pot for spaghetti sauces or soups. Very sturdy too. This spoon is perfect for stiring large pots of chili, soups, salsa (when we bottle it) and for large 5 gallon drinks. We love it! Descent spoon, good length for larger pots/pans. Steel is pretty good thickness and quality. I was surprised with this product happy so far. Will let you know if this changes-not much use as of yet.